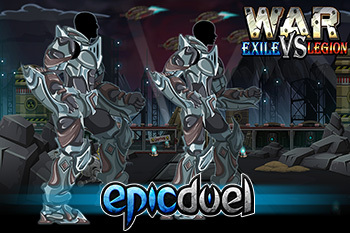 EpicDuel - Game Design Notes: Coming Soon: Overlord War! It seems that the embers of war in the Infernal Mines have barely cooled, but already a new region of Delta V is ripe for conflict. Early next week, the remote Overlord Facility will become the next backdrop of the regional war cycle, spurring Legion and Exile forces ianto direct conflict once again! What of the spoils? Guest Artist Deuce has crafted this marvellous Overlord Knight mutating armor to reward the victors of this upcoming war event! Battle with all your might to maintain or to seize control of this embattled military base to claim this exquisite, exclusive, mutating armor! You may be surprised to know that the Pyro Fly robot stocked on Kraggor is currently SOLD OUT! 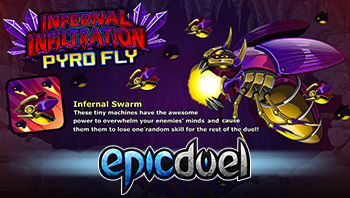 You may even be surprised to know that the Pyro Fly event came back! You may be EVEN MORE surprised to be reading the words on a magic slate made of light, possibly because you've been in cryo-hybernation for 10,000 years. If so, let us know! Anyway, since the Pyro Fly went so quickly, we'll be restocking Friday at 4:00 PM EST! This is the last restock we'll be doing on this bot this year. If you miss it, you'll have to wait until 2017! You've probably noted a lack of BioBeasts news here. You'd be correct! But that doesn't mean we've been napping at the lab. Quite the contrary! We've been undertaking a major overhaul of BioBeasts main interfaces and mutation systems to improve it's versatility and fun-factor, allowing us to create all the amazing content we've wanted to within a reasonable amount of time! In its current form, thanks to your continued support, BioBeasts has already passed the 100k install mark on Google Play and the rate at which people download the game continues to increase at a steady pace, despite very little marketing! After this overhaul is complete, BioBeasts will be on its way to achieving self-sustaining growth. We are very close to having previews ready, and should be ready to post updates next week!